NOTE: This article is about how to make an easy decongestant that really works! It’s an easy recipe that uses common kitchen spices to fight congestion, stuffy noses, post nasal drip, and may ease difficult breathing. You can get rid of a stuffy nose and congestion naturally, inexpensively, and stay chemical free. Oh! My gosh! I could hear my grand daughter in the other room, trying to breathe. She was ten years old, and we were having a nasty cold run through our home. One of the worst and most scary sounds in the world is listening to a child try to breathe through a stuffed up nose. I knew I had to do something about her congestion right away! Since I love my natural remedies, I went right to my best nasal decongestant recipe. When noses and sinuses get congested around here, it's time to get out the ingredients to make a decongestant that works WAY better than store-bought, plus is safe and natural. This recipe will quickly relieve your nasal congestion and make you feel better fast! Nasal congestion (a.k.a. stuffy nose) is very common as Winter approaches. In fact, many people suffer from stuffy noses off and on throughout the year due to seasonal allergies. Regardless of the reason for a stuffy nose, this recipe for natural decongestant is one you can have ready to go, just in case a stuffy nose strikes your home. If you have ever wondered how to get rid of sinus congestion naturally, you’ll love this quick and easy home remedy for natural decongestant! The BEST Natural Homemade Decongestant that REALLY Works! This is such a simple recipe. You’ll be using kitchen spices that you probably already have. These herbs mixed with a bit of honey and raw apple cider vinegar are healing and best of all….the work fast to help that congestion go away so you can feel better. Why Not Just Buy an Over the Counter Decongestant? Well, first off, OTC decongestants are often extremely addicting. Years ago I had a good friend who had taken Afrin so much (daily) that he HAD to take it or he seriously could not breathe, especially from his nose. He couldn't even tell if he was well or not. He had become addicted to this chemical stuff. This is NOT a good situation. These chemical mixtures are often filled with toxins and hormone disruptors. Why put unpronounceable chemicals into your body or your kids' little bodies when you can make your own decongestant with ingredients you know and understand? PLUS, it's a TON cheaper to make decongestant yourself, takes just a few minutes, it's actually pretty tasty, and best of all: It works! A NOTE about the spices & herbs used: If I'm not using fresh herbs I grow or buy organic, I get my herbs and culinary spices from Starwest Botanicals. I purchase from Starwest because I get super high quality herbs/spices at bulk prices. The shipping is fast, too. These herbs & spices are WAY better (higher quality, fresher, & more choices) than grocery store spices, which may have been sitting around for years and are not nearly as potent. Just a tip to save you some money and help you get the BEST quality. The ingredients for natural decongestant: Ginger chips (you can use fresh Ginger too), raw honey, lemon juice, raw apple cider vinegar, horseradish root (optional), Cinnamon chips, and Cayenne pepper. Horseradish (optional)---about 1 tsp freshly grated. If you are in a rural area like I am (a food desert), you may not be able to find horseradish in the stores. But! You can order fresh horseradish on Amazon. **If you are planning to use this with young children, I would definitely do a taste test and dilute it well. You can reduce the amount of Cayenne you use although the cayenne is part of what makes it work so well. Although this is a very safe decongestant, I do not recommend use for children under two. Just add all the ingredients into a sauce pan. Bring to a simmer on LOW for about 5 to 10 minutes. You don't want to go crazy here and boil it...just a nice slow little bubbling simmer. This allows the herbs to release their active constituents into the mix. Remove and strain the liquid into a jar. I use a fine mesh strainer. If you are using powdered cinnamon & ginger, you can lay a layer of paper towel over the strainer to catch more of the herb. This is an optional step. Let cool down, then put on a lid and store. This will keep a long time due to the acids in the lemon juice and vinegar and the antimicrobial nature of the honey. If it's been awhile since you made your decongestant, be sure to do a sniff test, or just whip up a new batch. It's so easy! If I'm using a lot of it, I will store it on the counter. If it's not going to get used fairly quickly, I'll put it in the fridge. EDITED NOTE: One of my readers wrote in and commented that she would add the honey after the heating process so as not to kill the beneficial enzymes in the honey. I have not tried making this decongestant this way, but it would be worth experimenting! Honey absolutely has beneficial enzymes that help heal the body, but I believe in this traditional remedy it was added for its soothing and sweetening properties, and to offset the acids and heat of the spices. Second NOTE: Adding the honey after the cooking works just fine! I had to add some additional vinegar to keep it from reducing too much, but that’s ok in my book. Look at that steam! Don't you love watching steam in the cold? Here, I'm straining out the liquid from the herbs. Any powdered herbs you used will be retained in the liquid unless you use some paper towel. Personally, I like having the extra powders in the liquid. It makes it even more powerful. 1) SHAKE WELL. This makes sure any powdered herbs that settled will be dispersed into the liquid equally. 2) Just take a teaspoon or two once to several times a day. If it's too spicy, you can dilute in a bit of water or tea. I like it straight! When I use my handmade decongestant, my nose generally starts to run a bit, I feel energized and more clear-headed and warm....and this is a GOOD thing! It means mucus is breaking up in those nasal/sinus passages. This is a very safe decongestant that can be used often. How This Natural Decongestant Compares to OTC Decongestants. 1) First, it works naturally to help loosen and expel mucus. It works quickly too, although you will notice the effects are different from the chemical OTC's. 2) Second, you'll have to take more than the amount in an OTC decongestant, such as a nasal spray. Luckily, it tastes ok so that shouldn't be a big deal. Also, it's GOOD for you! 3) Third, this natural decongestant has so many other health benefits that work on multiple systems in your body, which an OTC decongestant will NOT have. For instance, your heart, your lungs, your circulation, energy, blood sugar levels....all are improved by using the herbs in this mixture. In fact, an OTC decongestant, with all its nasty chemicals, will cause your liver to work overtime in order to filter out the impurities from the chemicals. How Does Natural Decongestant Work? The lemon juice and especially the raw ACV (Apple Cider Vinegar) help to thin that thick, sticky mucus in the nasal passages. Both also have many other health benefits too. Honey has been used for ages as a remedy for colds and flu. Additionally, it is antibacterial and antiviral. Honey soothes the throat and membranes. Cayenne, Ginger, Cinnamon, and Horseradish help to open up the sinus passages. The Cayenne, the Ginger (and the honey as well), all have exceptional expectorant benefits. This means they help loosen up the mucus. More about Cayenne: The capsaicin in the Cayenne is a literal miracle compound. It's a pain reliever and also helps to reduce the inflammation that causes the nasal passages to close up. This is kind of counterintuitive, since it's such a hot and spicy herb. It's great for your blood vessels. My husband says it tastes like a hot and spicy Apple Cider. LOL---so that tells you it tastes ok--just a bit spicy. It warms you right up, too! It’s a blessing to be able to make your own remedies! Every year without fail, from the cold & flu season of late Fall through the miserable allergy season of mid summer, I’m asked for jars of this natural decongestant. It works for children as well as adults, and it’s some powerful, helpful stuff. It’s so fast and easy to make, too, and the shelf life is quite long. Most oxymels (herbs mixed with honey and raw vinegar) will last for months in your refrigerator, and even quite a long time outside of it too! The vinegar and honey both act as preservatives, while providing the perfect solvent for getting the plant chemicals out so they can work in your body. I hope you’ll give this a try! You’ll never go back to using those dangerous over the counter medications with all the side effects ever again! :-) You may even want to just drink this as a tonic….it’s that good! Let me know if you tried this recipe and how it goes for you! Just leave a comment in the comments section if you have questions or would love to share! Would you like to become a home herbalist, being confident and empowered in your abilities to use herbs in your daily life? Take a look at my new online course, The Confident Herbalist: A Guide to Home Herbalism. It’s for beginners, and will lay the perfect foundation to get you started! If you are more advanced in your herbal skill, I suggest taking a look at the Herbal Academy of New England, as they have many courses for all levels and interests! How to Boost Your Child's Immune System. Also---one more thing I wanted to mention is about using sinus rinses. These are great for helping clear up congestion too. My little caveat on rinsing your sinuses is this, however: Don’t rinse your sinuses or use a neti pot if you have a full blown or beginning sinus infection. All the sinus passages are connected, and you don’t want to spread the infection. Ask me how I know. Ahem. Do you make your own handmade remedies? 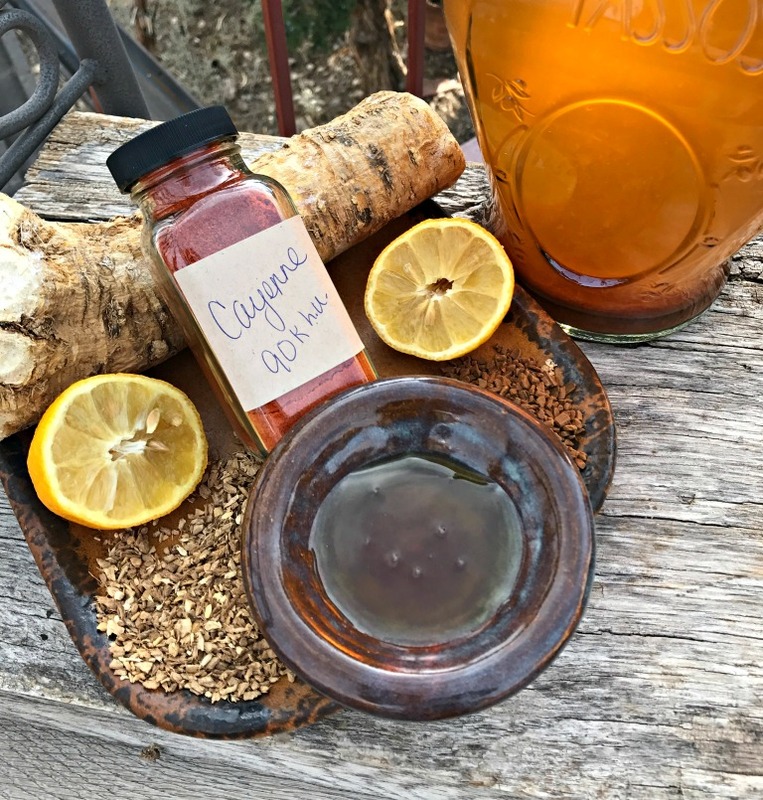 I'd love to hear your thoughts, and if you have questions about making this decongestant, please leave comments in the comments section! P.S. If you haven't signed up for our newsletter yet, I'd love for you to join our community! You'll never miss a thing, and you'll get immediate access to the valuable and growing Resource Library! You’ll find all kinds of downloadable eBooks, guides, checklists, and more being added weekly! Here is the finished decongestant. Notice I'm storing it with a plastic lid for Mason jars---that's because of the acids from the lemon juice & ACV---these tend to corrode the metal on a typical Mason jar lid. You can find these in any store that sells canning supplies. P.P.S. I have to make this disclaimer too: I am not a medical doctor. In no manner is any article on my website, including this one, meant to diagnose, prevent, treat, or cure any health ailment. Please see a medical doctor for any issues. I simply provide my own advice/opinions based on my years of experience and study. Every person is responsible for their health choices. Please do your own research! May 16 ALLERGY TEA---Get Rid of That Stuffy, Runny Nose Naturally with Herbs!